Seattle, WA – Ghostfish Brewing is set to launch Killer Ale IPA on March 9, 2019, a bold and distinctly Northwest influenced India Pale Ale brewed to benefit Washington-based Orca Protection & Rescue. Founded in 2018 by Captain Hobbes Buchanan, Orca Protection & Rescue (OPR) is dedicated to the protection and rescue of all marine wildlife in the Salish Sea, by reducing private and commercial vessel harassment, assisting with strandings and entanglements, and removing ghost fishing gear, marine debris and plastics. After learning that Brian was an owner of Seattle-based Ghostfish Brewing, Captain Hobbes contacted Mr. Thiel a few days after their initial acquaintance. He shared more about OPR and what the organization was doing to help save the whales and wildlife in the Salish Sea. “Brian seemed like he really cared about the whales so I decided to approach him with this partnership idea. Who doesn’t love whales and ales….it just seemed like a match made in heaven….and a great way to raise funds to help save these magnificent animals. Orca whales are looking like the canaries in the coal mine. If we don’t act now to save them, we humans are the next to go,” stated Captain Hobbes. Join Ghostfish Brewing and members of the OPR organization to celebrate this partnership and release of Killer Ale IPA at an educational themed launch party on March 9, 2019 at the Ghostfish Brewery Taproom, between the hours of 2 – 5 pm, located at 2942 1st Ave S., Seattle, WA 98134. $1.00 of ANY beer bought that day will be donated to the OPR towards fundraising efforts. Representatives of the OPR will be speaking on various topics pertinent to their organization’s mission as they relate to the SRKW population of the Salish Sea. The main topics they will be addressing include food, harassment, noise, and marine debris and plastics. Killer Ale IPA will be available in limited 16oz can 4-packs and on draft at the Ghostfish Brewery Taproom and at select retail locations throughout Washington. 10% proceeds from the sale of Killer Ale IPA benefit the OPR. Captain Hobbes Buchanan was a former whale watch tour operator (for 18 years) who in 2018 realized he was part of the problem regarding vessel noise and harassment. He started OPR in the Fall of 2018 as a non-profit dedicated to the survival of our endangered SRKWs and all marine wildlife in the Salish Sea. Learn more and donate at www.orcaprotection.org and www.facebook.com/OrcaProtection/. Seattle, WA— After recently expanding its distribution to Eastern Washington and Northern Idaho with the Odom Corporation, Ghostfish Brewing Company is excited to announce its launch into Northern Oregon. Ghostfish Brewing’s draught and packaged beers will be distributed by General Distributors Inc. (GDI). Seattle, WA— Ghostfish Brewing has brewed a limited amount of a very special anniversary beer for their upcoming celebration. This Wood-Aged Imperial Brown Ale has an intricate grain bill featuring a veritable rainbow of rice and millet malts, giving it a complex nutty sweetness and full-bodied taste. Wood-aging on hard maple staves for two months softened the alcoholic sharpness of this sturdy brew, and contributed mild tannins and woody aromatics to help balance the malt character. Seattle, WA – Ghostfish Brewing Company recently expanded its distribution footprint throughout Eastern Washington and Northern Idaho. Seattle, WA – While you sit inside Ghostfish Brewing’s taproom you are bound to look out through the expansive wall of glass windows to see a parade of cute and adorable dogs stroll by. Led by volunteers, these dogs are out stretching their legs from their cozy stay at the nearby Emerald City Pet Rescue shelter. Emerald City Pet Rescue (ECPR) was established in 2013 in Seattle, WA as a non-profit dedicated to rescuing and rehabilitating neglected animals. They predominantly pull animals from high-kill shelters from around the country and place them in loving forever homes. 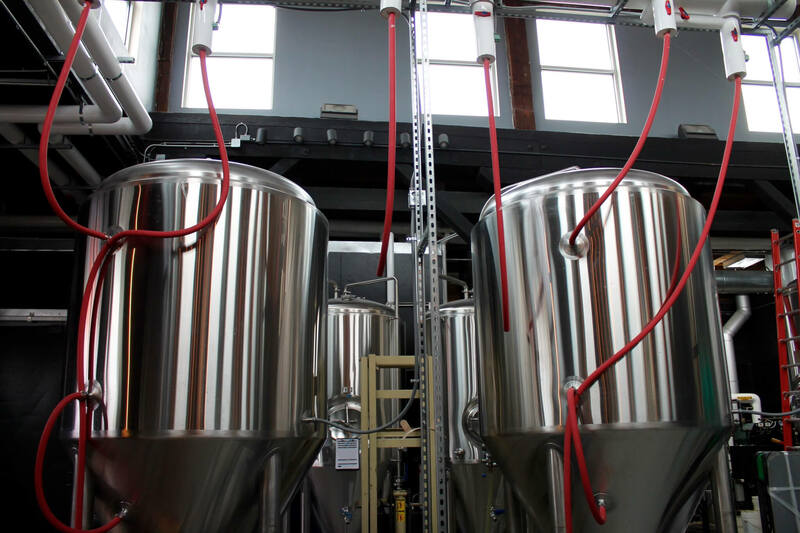 Seattle, WA – The sound of heavy metal can be heard within the walls of the Ghostfish Brewery and we’re not talking about screeching guitars and booming drums. We’re talking about gold, silver and bronze medals! 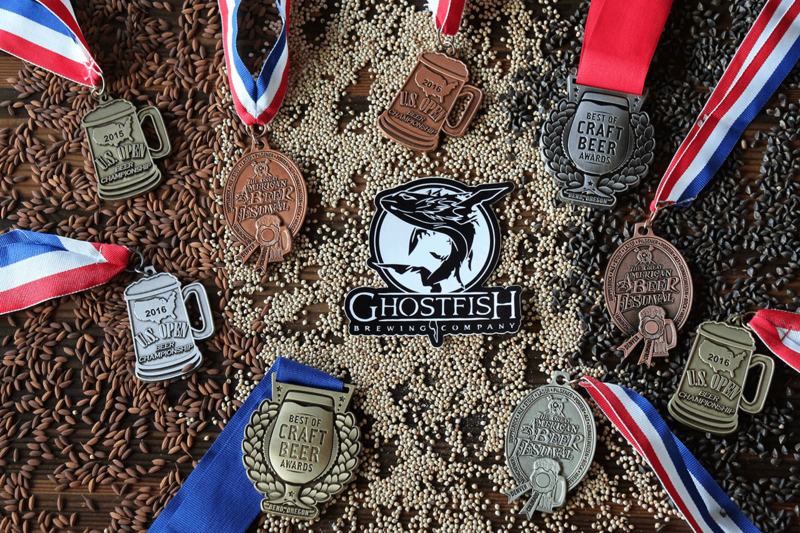 Ghostfish Brewing Company recently learned that three of their beers received medals at the 2016 U.S. Open Beer Championship within the Gluten-Free Beer category. Seattle, WA – Ghostfish Brewing Company recently signed with three distribution companies (The Odom Corporation, Marine View Beverage, and Sound Beverage Distributors) to distribute its award winning ales throughout Western Washington. These three companies collaborate as members of the Great Artisan Beverages Company (GAB). GAB is a wholesaler network covering multiple states with a vision to market and sell leading craft and specialty beverage products.